Our company culture speaks to who we are, the type of agent we attract, and how we are perceived by the consumer of real estate services. We believe in a simple formula: Hire top-notch people. Train and support them. And provide all the latest tools and technology. We focus on what is really needed to successfully partner with an agent to assure their success. That is, client-centric marketing, comprehensive technologies, automated systems and an inspirational culture. Our comprehensive proprietary platform puts the latest technology at your fingertips, all in one place. Our multi-faceted approach to training and support is designed to make all things easier for today’s busy agent. Marnie Goldschlag, Teri Villeggiante, and Broker Jock McNeill are the Realtors and Owners of NextHome Wine Country Premier. Combined they have over 50 years of real estate experience including residential sales, commercial sales, and property management. Marnie, Teri, and Jock are lifelong residents of Sonoma County. They are active in our community through Rotary, Leadership Santa Rosa, and several non-profit organizations. They also teach students, brokers, and agents about sales and property management. Marnie, Teri, and Jock always strive to consistently deliver a high quality real estate experience to their clients. Their experiences and journeys have led them from success at a large national franchise, to independent brokerage owners, to being awarded the first NextHome franchise in the Sonoma County. They are ready to share their love and knowledge of real estate with you. Even with the latest technology and cloud based services, real estate is still a face to face business. We want agents to maximize their time growing their business in the best way possible: by increasing face time with their clients. Agents have the option of working in our office location or their own home. Our agents can access client information, create new listings, craft buyer offers, and much more at any time, from any place. We have a in-house transaction coordinator to help ensure the paper work is complete to make your escrow go smoothly. Go completely paperless by using your own e-Sign and Transaction Rooms by DocuSign. This allows you to work from anywhere! When agents join NextHome Wine Country Premier, we pay for their first order of high-quality, specially branded and produced personalized business cards. NextHome made a significant investment to create a striking brand that resonates with agents and buyers and sellers. The brand is driven by understanding the lifestyle and trends of consumers, keeping you relevant throughout the future. The NextHome brand is fresh and there is no other branding like it in the real estate industry today. Knowledge is power and essential to your success. Weekly trainings and education sessions are accessible both in-office and remotely. In addition there are online training videos, webinars and publications to improve your abilities and increase your income. Communicate directly with a live NextHome corporate support staff person that is focused on responding promptly and accurately to your questions. Or, ask your broker! And for brand new agents, we offer a mentoring program to develop the knowledge and confidence before you go off on your own. Go to your next listing presentation with personalized CMA material binded in a NextHome branded book or optimized for your tablet with a wow factor like no other. Don’t worry about expensive development cost to get your own app. We have you covered with your own customized app that your clients will want to use. We enable our agents to receive leads we generate (and those they cultivate) directly to their mobile device. And aside from referrals, most buyers and sellers find their prospective agents online. Our programs assure agents a strong social media presence to ensure they are found. For agents who want to work floor time at the office, no problem! 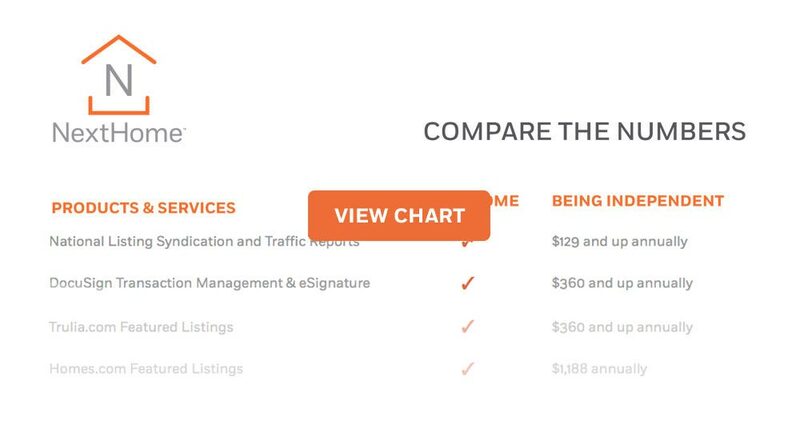 Competitive commission splits along with superior computer systems, lower royalty and service fees, vendor selections, and other services are all designed to substantially drive down the costs for agents to become financially successful in their careers. At NextHome Wine Country Premier we believe straightforward plans are always better. No one likes surprises, especially when it comes to your money. NextHome Wine Country Premier offers a straight forward commission system with no start over anniversary dates. Brand new agent? No worries! Our plan will benefit you too. Made with in Santa Rosa, CA. Each office is independently owned and operated. Servicing Sonoma County, CA.